I absolutely love Autumn. To quote the imitable Miranda Priestly from The Devil Wear’s Prada, “September is the January of fashion”. Between the various fashion weeks and the AW collections hitting shop floors, it’s such an exciting time. 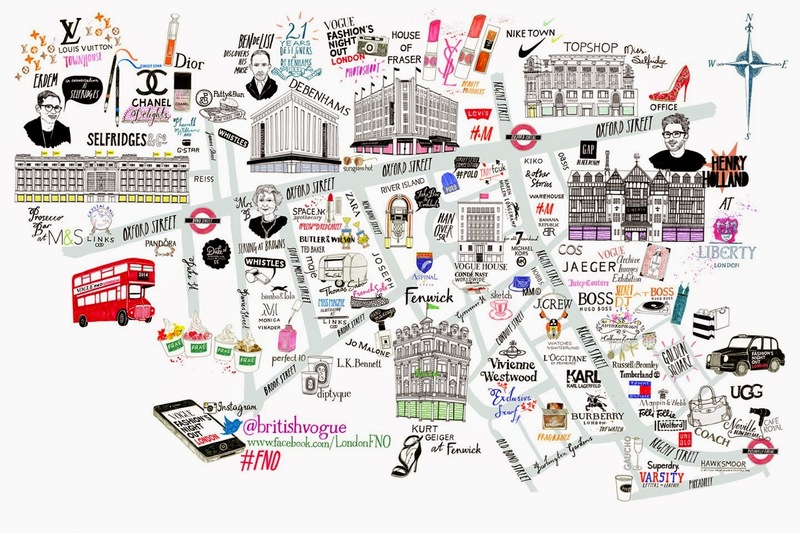 The cherry on top of the September fashion cupcake is, of course, Vogue Fashion’s Night Out. Now in its 6th year, the global celebration of fashion is returning to London tomorrow night promising to be bigger and better than before. Browns – Vogue Fashion Director Lucinda Chambers and designer Roksanda will be in store offering style advice while the Bursein family will be behind the tills serving customers. Selfridges – Vogue Deputy Editor Emily Sheffield will be speaking to Erdem about his latest collection and creative vision after a screening of his SS15 collection at the Selfridges Everyman theatre. Aspinal of London – Instagram your favourite bag with the hashtag #AspinalFNO for a chance to win a piece from the AW14 collection. French Connection – Join acclaimed illusionist Troy in store for some astounding feats of magic. All Saints – Preserve your FNO memories in the interactive photo studio while model/DJ Mary Charteris spins some tunes. House of Fraser – The team at YSL Beaute are on hand to give you a glam makeover before a FNO cover shoot! Millie Mackintosh will also be in store to launch her new collection along with DJ Jameela, exclusive offers and a fab treasure hunt. River Island – Join my blogger pal Kit Lee for customisation workshops. Superdry – Customise your very own leather jacket with colourful varsity letters. There will also be music from Fire Flies and the gorgeous Lilah Parsons will be in store talking all things fashion. H&M – The Swedish high street giant are pulling out all the stops with a celebrity DJ, photo booth, blowdry and nail bars and a free personalised tote when you spend over £20. Links of London – The lovely Miss Magpie Fashion Spy will be in store to sketch you on the night for a FNO momento to keep forever. Perfect 10 – Head to South Molton Street and keep an eye out for the bold Perfect 10 minis for a mini mani to transform your nails. Bimba & Lola – Peer into the future with the night’s resident fortune teller who will be using customised tarot cards. Patty & Bun – Serving up the official FNO burger, The Blue Steel-ton, a double burger smothered in blue cheese with buffalo-butter sauce and topped with roasted jalapenos. Who said fashion folk don’t eat? !